I belong to a visible ethnic minority group. In a crowd of people I don’t know, I am often most easily identifiable by my skin colour. Laws such as the Racial Discrimination Act, including the controversial section 18C were written to ensure people like me are not disadvantaged and discriminated against because of our ethnicity. Unlike many community leaders however, I am strongly of the opinion that Section 18C of the Racial Discrimination Act, as it stands, has no place in a free society. I became a citizen of this country because I subscribed to its core values. A fundamental value of our society and of Western civilisation more broadly is freedom of speech. As Descartes pithily put it, “I think therefore I am”. An individual is therefore only free if he enjoys freedom of thought, and the freedom to express his thoughts without fear of censorship. Naturally, there are limits on freedom of speech where it is in conflict with other natural rights. Limits to free speech exist where its exercise endangers individuals’ safety and their property. Hence we have uncontroversial laws against inciting racial or religious hatred. We also have laws preventing freedom of speech being used to disclose classified information where it can endanger national security. Section 18C is unacceptable because it restricts free speech for the relatively petty purpose of protecting individuals’ feelings from being hurt. Section 18C prohibits speech that offends, insults or humiliates a person based on their race. The problem is that each of these terms represents a subjective emotional response. It is not acceptable to curtail free speech simply to prevent emotions from getting hurt. Section 18C was used to restrict Andrew Bolt from openly discussing who was receiving taxpayer-funded grants intended for disadvantaged Aborigines, an issue of public interest. He was found guilty because “fair-skinned Aboriginal people (or some of them) were reasonably likely, in all the circumstances, to have been offended, insulted, humiliated or intimidated by the imputations conveyed in the newspaper articles”. Considering there was nothing remotely intimidating in his offending articles, it is clear Bolt fell foul of the law simply because the plaintiffs felt offended, insulted or humiliated by his articles. Even though I am exposed to racist insults as an Indo-Australian, I do not want to live in a society where people can be dragged through the courts because someone’s feelings were hurt. Andrew Bolt was fortunate to be backed by his employer, but the verdict in his case means that those of ordinary means are best advised to keep controversial opinions on race to themselves lest they offend, humiliate or insult someone. The very point of freedom of speech is to tolerate speech that is distasteful and offensive. As the quote popularly attributed to Voltaire goes, “I disapprove of what you say, but I will defend to the death your right to say it.” No matter how misguided, the right to make a speech that does not threaten someone’s safety or property should be defended on principle, not suppressed by the force of the law. The Attorney General famously commented in the Senate that people have the right to be bigots. It should be emphasised that exercising that right comes at a high cost, which includes social ostracism and isolation, reduced employment prospects, and widespread condemnation. Just ask Pauline Hanson. 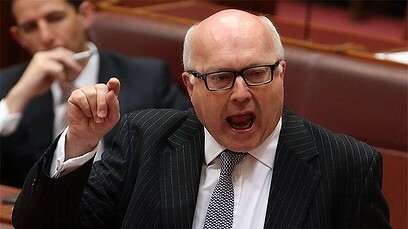 Brandis’ comments about everyone having the right to be bigots have stirred a lot of controversy. Like ignorance, racism, bigotry and intolerance cannot simply be legislated away. Making it illegal to racially offend someone simply drives bigots and racists underground. As an ethnic minority, it is important to me to know who the racists are. Freedom of speech is a beautiful thing as it allows racists to incriminate themselves. I would much prefer to able to identify the racist bigots and shun them, than have to second-guess them. Provisions such as section 18C actually empower racists. They feed racists’ already heightened levels of victimhood. They allow populist racists to claim they are being censored by the establishment, which is of course in the pocket of [insert targeted minority group]. Such laws existed in Weimar Germany but failed to stop Hitler from rising to power. Pauline Hanson would probably have been more successful if she could claim she was banned from speaking up for her supporters, by a government that was in thrall to Asian immigrants. Section 18C is also patronising to ethnic minorities. It implies they need the protection of the law because they are somehow not capable of dealing with racially offensive and insulting behaviour on their own. Racism can certainly be enshrined by legislation, but it cannot be removed by legislation. Historically, racism has been defeated through the power of reason and persuasion, by convincing humanity that we are much more than the colour of our skin. We should be confident in our ability to easily defeat racists in debate, without needing to rely on the law to silence them. The government has made an admirable attempt to accommodate the views of ethnic and religious communities in drafting the amendment to Section 18C. While it was initially meant to be scrapped in its entirety, it is now being retained with the proposal to replace the words “offend, insult, humiliate or intimidate” with “intimidate or vilify”. Some Jewish groups made the valid point that existing defamation laws only cover individuals and do not protect an entire community from defamation. The inclusion of ‘vilify’ in the proposed amendments to Section 18C thus strengthens protections for minority communities compared to the existing law. Trying to outlaw racism and bigotry is an exercise in futility. It serves to broadcast the good intentions of the ethnic majority more than it meaningfully helps the minority. Freedom of speech is too sacred and important a right to sacrifice to promote the putative but non-existent right to not feel offended. Instead of defending a puerile, patronising law, ethnic minorities should welcome the proposed amendments to Section 18C of the Racial Discrimination Act.